My first ever hair tutorial is here! But before I share with you my new discovery, let’s talk about hair care first because no hairstyle can ever look perfect without it. I understand it might be tempting to skimp on it, but trust me, don’t. Proper haircare and a maintenance routine are key to nailing your dream hairstyle. I should know. I’ve had countless treatments and hairstyles done that have damaged my hair and the only way I was able to salvage my hair was by investing in hair products. 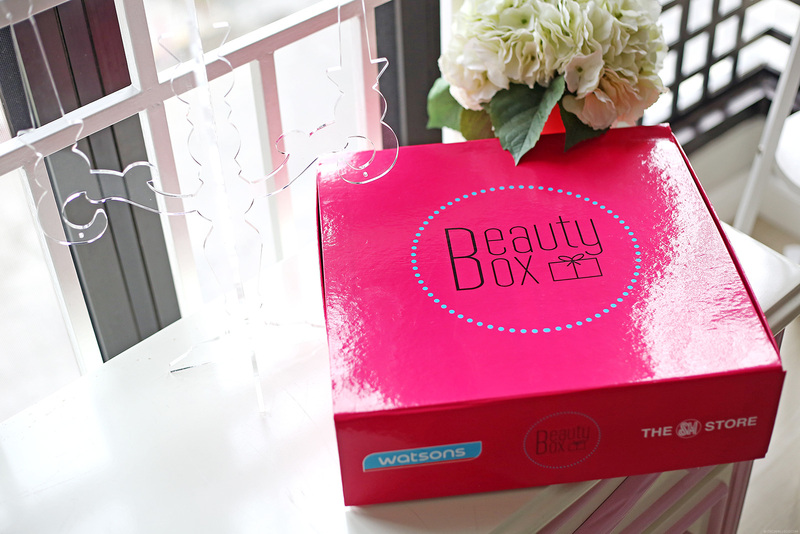 This is why I went a little crazy when I got Watsons’ Beauty Box filled with exclusive “hair wonders”. Look at all these precious hair heroes! They’re only available at Watsons and you can even get special discounts and promos when you purchase any of them there. I’m currently obsessed with products that have Argan Oil and similar ingredients so my favorites are definitely Moist, Diane’s Shampoo and Conditioner and L’oreal’s Extraordinary Oil. They make my hair looking silky smooth and feeling healthy. As for hairstyles, Toni & Guy’s Forming Spray Gel is great because it’s non-sticky and doesn’t make my hair look like it’s as stiff as a wall. How about you? What caught your eye? 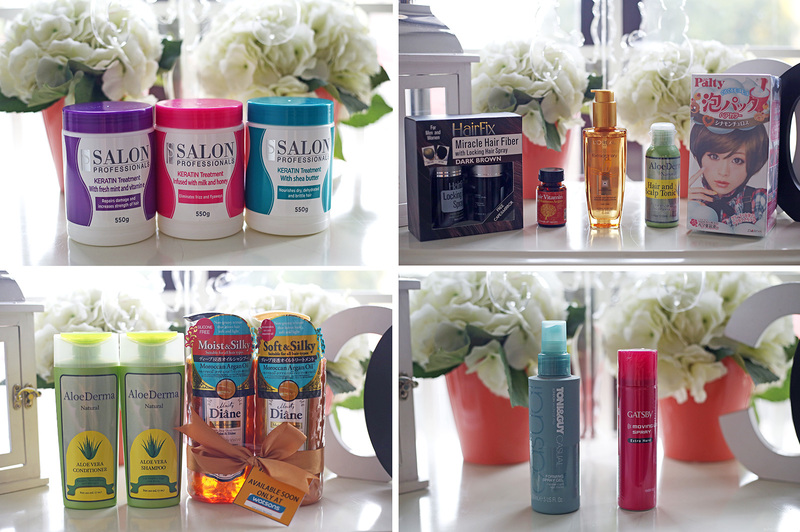 Watsons has all the hair must-haves to solve your hair care and hair styling needs so you must have a favorite or two here. Once you get these exclusive Watsons Wonders Hair Products from any Watsons Store, you can finally achieve your dream hairstyle and experiment with more like this braided updo I’m about to share with you. 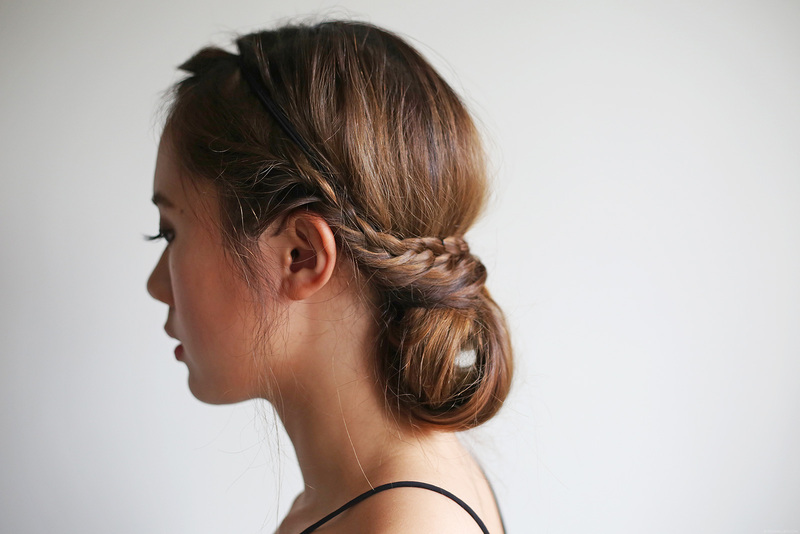 It’s a simple messy updo with braids here and there.–perfect for a casual boho look. My assistant and I got inspiration from tutorials on Youtube and added a few of our own ideas. It’s our first time to attempt this hairstyle but hopefully, you guys like it. All you need are bobby pins, elastics and an elastic hairband. I didn’t have my plain headbands with me so I used Goody’s Doublewear Elastic headband instead. The chain part is going to be covered anyway. But if you want the chain part to be seen and worn the other way then that’s okay too. Part your hair into 3. Gather the middle portion in a low ponytail. Fold the middle portion outward and insert your loose ponytail’s ends inside the elastic. Twist the right portion of your hair. Insert the ends of your twisted right portion inside the the rolled up middle portion of your hair. 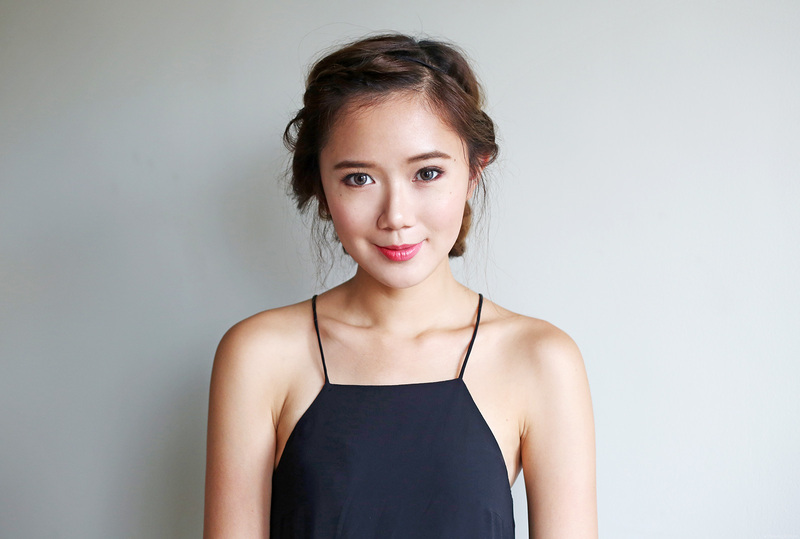 For the remaining left portion of your hair, gather a small section and braid it like so. Start with a thin braid and build it up by getting parts from the remaining section of your hair. Make sure to gather the remaining section of your hair only on the left most part of your braid. 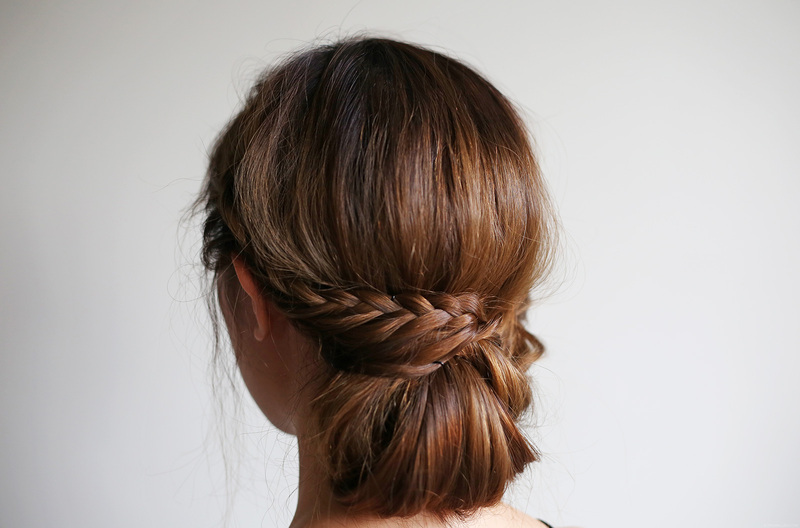 Your braid should look like this. Overlap your braid with the twisted part that you did on the right portion of your hair. Insert the ends of your braid inside the rolled up portion of your hair. Secure it with as much bobby pins as you want. This is how it’s supposed to look from the side. Now, it’s time to start braiding your bangs. Again, start with a small braid and build it up bit by bit. Make sure to add the remaining section of your bangs only to the outmost part of your braid. The appeal of this hairstyle is that it looks effortless so don’t worry about a few loose strands here and there. You can spray on a bit of dry shampoo before doing this hairdo if you want to add more volume. Feel free to curl your hair too to make it look messier. My hair is naturally wavy so I skipped this step. Finally, set your hairstyle with Toni & Guy’s Forming Spray Gel (which is a Watsons Wonders Hair Product) and you’re ready to go! I’m sure it’ll be longer in no time! Kuddos also to ate Cla! Hehehe! Miss you cams! Lol! My hair is curly so I have naturally messy hair haha!! I’m honestly no good at hair but luckily my younger sister is. *happy dance* I’ll show this to her Cams and hopefully we can replicate it when my hair is long enough! I really like this look from head to toe. This was what you wore to the H&M launch right? That looks so pretty and simple. I’d like to try it. Thanks for sharing. So cute!! !Perfect for summer outfit shoots!I regret cutting my hair into short one! I’m never really good at managing it that’s why it always suffer~ And I just noticed it, (probably the first, although you always wear sleeveless tops) your under is so pretty! How were you able to manage that? Cutie!!! This hair style can also work for formal events too!! I’ll definitely try this once my hair grew longer :'(((( I’m seriously regretting that I had it cut into shoulder length. I have the same prob with Kryz (tips tend to fly away) and my hair’s dry because of my everyday shampoo routine. Oh well, thanks for the tip, looks like I’ll be doing some hair care shopping on payday lol! You know what she does? She blowdries her hair while pulling portions of her hair down. :) Works like a charm! ps: you might see a similar comment on your previous post. it was also me. i thought i wasn’t able to send it successfully so i decided to re-comment or give a message. hi miss camille.. i’ve been a reader of this blog since 2012 and trust me, i fell inlove with you since then. Dont worry i’m straight. haha. i luuuurrve your style, beauty and personality. I don’t know you personally but i can see and feel it through ur posts(IG), and blog entries. i love how you make your blog entries sound humurous. it just shows your bubbly side. i am so inlove with your style. sometimes girly, sometimes egdy but forever sophisticated. Your style is wearable. i mean, it is something that me and my fellow readers can copy. hahaha. i dream of seeing you in person someday but sad to say, i’m just a hopeful reader/fan from Davao. but who knows, God might do something and bring you here. hehe. continue inspiring other people. love ya. Haha! Thank you Carol! :) I am bubbly, sometimes too bubbly! LOL! I’m glad you guys appreciate it! Hopefully, I’ll meet you some day! I usually get mine in Sephora but Watsons has dry shampoos too!